On Tuesday, the Scioto County Sheriff’s Office along with the Southern Ohio Drug Task Force announced the arrest of a Portsmouth man on numerous felony charges ranging from grand theft auto to receiving stolen property along with several drug charges, including trafficking in heroin. Arrested at 10:58 a.m. Tuesday was Jim Edwin Smith, 41, of 179 Stockham Hollow Rd., Portsmouth. 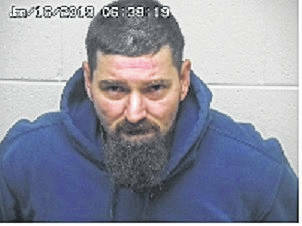 The roster of charges against him include three counts of grand theft auto, felonies of the fourth degree; three counts of receiving stolen property, felonies of the fifth degree; one count of trafficking in heroin, a fourth-degree felony; and, one count of possession of heroin, a felony of the fourth degree. The charges stemmed from investigations conducted by the sheriff’s office and the task force which resulted in cases against Smith being presented to a Scioto County Grand Jury. Warrants to arrest Smith were issued by the Scioto County Common Pleas Court. Two all-terrain vehicles and a riding mower, reported stolen to the sheriff’s office, were recovered during the investigation. Smith was placed in the Scioto County Jail and is being held without bond until he is arraigned in Scioto County Common Pleas Court. Sheriff Marty Donini requests anyone wishing to leave drug information for the Southern Ohio Drug Task Force phone the Task Force tip line at (740) 354-5656 or email drugs@sciotocountysheriff.com. Officials said all information will be kept confidential and anonymous.